Previously the artist has employed prosthetics, costume and methods of disguise to transform herself into the numerous fictional characters within her video, often borrowing from the aesthetic and artificiality of low budget television and film. 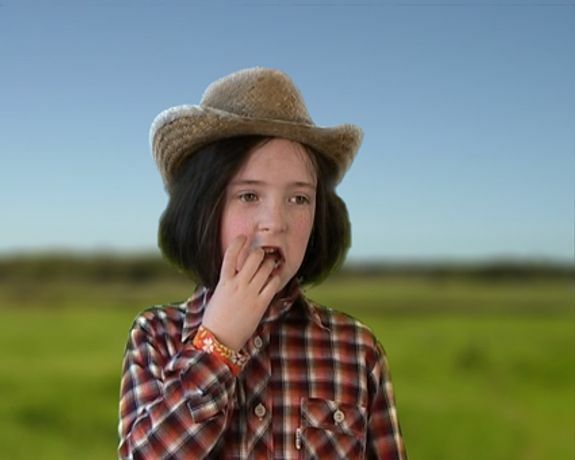 For the first time Eyres moves behind the camera to recreate an episode from the melodramatic and internationally popular soap opera, using child actors for each character. In the new work, as in the past, Eyres offers a critical interpretation of the codes of internationally distributed mass culture. Not long after its debut in 1978, Dallas became the most popular show on television and continually lured its audience with the promise of an impending twist or cliffhanger, yet inevitably depended on a stable cast made up of characters who were reassuringly consistent. As such one can presume that viewers of the new work will be familiar with the characters and, to some extent the plot, whether or not Dallas precedes their cultural memory, as is the case with the child actors. The appeal of watching soap operas is often noted as being associated with notions of escapism through emotional involvement with the characters. The casting of adolescents as the characters of Dallas fuses recognition with strangeness and estranges the familiar. Awkward, embarrassed and vivacious the child actors function in distancing the viewer and preventing full identification with the characters. This is furthered by the use of deficient costumes, hand-made sets made by Eyres and lamentable acting. It is no coincidence that Eyres selected this episode to recreate, with its cliffhanger dream solution which inevitably questioned the reality of the show's characters and the viewers relationship to them. The film will be shown alongside a selection of drawings by the artist from the past five years which feed into a reading of the film and reflect some of Eyres' ongoing areas of interest and investigation into mass media, television, the family and the representation of women. Often using magazines and dated textbooks as her source material, Eyres' characters are disquieting and vulnerable. As with her films the viewer is persuaded to engage in the states of watching and being watched. Having used material ranging from child psychology books from the 80's to hair style magazines; the experience is never wholly satisfying and one is left with a sense of fracture.